It's comfort food season, and pear season—which, in my opinion—go hand in hand. I had some pears that I wanted to use up and I was trying to think of the best way to do so. 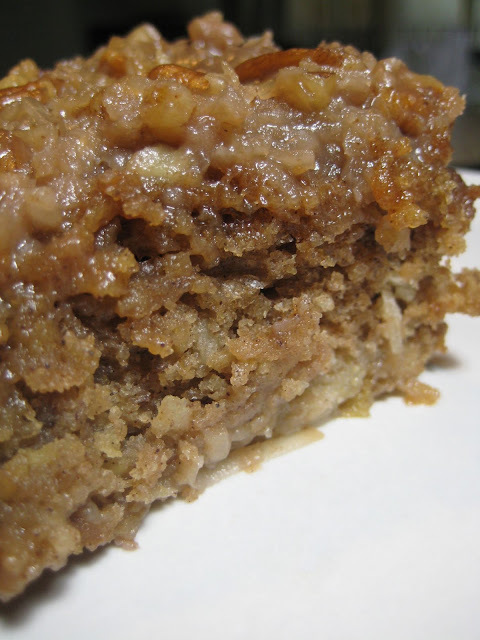 I remembered my sister-in-law's (and her mom's) famous and amazing Oatmeal Cake. They have always done it in a bundt pan, but I figured I'd try this cake with pears on the bottom, in a 9x13 pan. It was magical! Seriously, this is one of my favorite cakes ever. It has so many of my favorite elements, cinnamon, oatmeal, coconut, pecans, caramelized goodness, and now pears. Make this cake! Your everything will thank you! Butter a 9X13 cake pan. Line bottom of the pan with prepared pears; set aside. In a bowl melt butter and combine with oatmeal, add boiling water, let sit for 20 minutes. Add remaining ingredients and mix well. Pour batter over pears and bake at 350° for 30 minutes, or until golden and cake springs back at your touch. Heat the butter, sugar, and heavy cream until the mixture begins to bubble on the sides, making sure that the butter is completely melted (do not bring to a boil). Fold in pecans and coconut and pour over hot cake. Place under the broiler (lo broiler) for 1-3 minutes and watch carefully so that the coconut doesn’t burn. The topping should bubble and become somewhat caramelized. Put this in your face as soon as humanly possible. Here is a somewhat similar recipe to my banana cream pie. Just made this with my 5 year old daughter...I haven't sank my teeth into it yet though!! Can't wait!! I pinned it too;) Love ya!